One of Robert's friends at Grinnell College has a book, "Departures", by the artist Lawrence Yang, who has the dubiously-named website, http://www.suckatlife.com/. Robert and friends took a liking to a certain "Balloon Angel" in the book. On May 14, 2010 when Robert had his fatal pole vault jump, he was wearing a henna tattoo of that angel on his right shoulder. A classmate of Rob's did the henna tattoo (a natural non-permanent tattoo) for him. 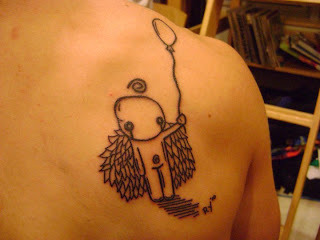 In sympathy, several of Rob's Grinnell friends have gotten a permanent tattoo of the Balloon Angel on themselves, in tribute to Robert. When a Wootton High School friend heard this, she wrote the artist. 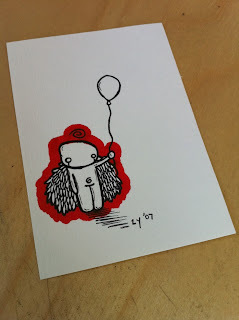 Lawrence Yang graciously sent Robert's mother the original drawing of the angel (left). 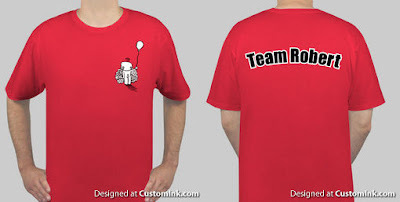 Lawrence also gave permission for the patron angel to be a logo on the front of the "Team Robert" t-shirts that were sold for the 4x400 Relay in August, 2010.